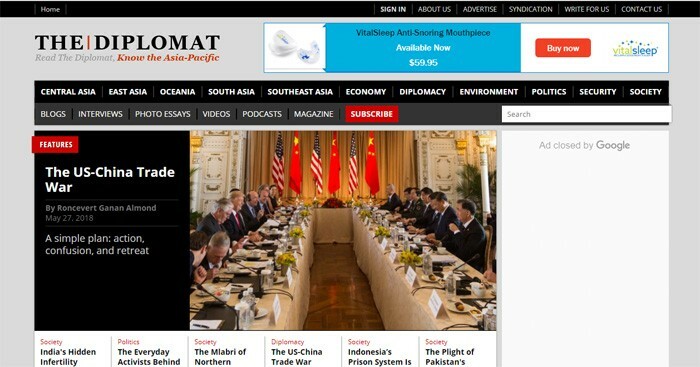 Can You Really Make Money Writing For The Diplomat? 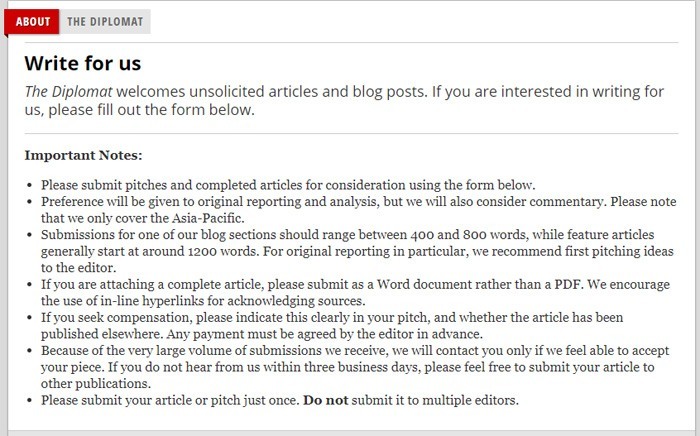 This website claims to pay writers for submitting articles. But can you really make money writing for The Diplomat? I found thediplomat.com on a list of websites that I was looking through lately that pay for articles from freelance and outside writers, and must say that I was intrigued by it. This site is unique in the sense that it is more of a ‘news’ and ‘current events’ type website than some of the others I have looked at. I have been able to find more and more of these types of sites as of late… and by ‘these types’ of sites, I means websites that pay freelancers for content. Of course, there is a learning curve to these types of things. Just because you write something and submit it does not mean that you are going to make any money. In fact, on some sites, it does not even mean that you are going to hear back! But as a writer who has had work published on websites like this in the past, I can safely say that it is completely possible to get your work published on websites as a freelancer, and to make pretty good money at the same time. Will it be worth your time to try to submit articles to The Diplomat, though? How much do they pay? Also, how difficult is it to get work approved by them? These are some of the questions that I was interested in having answered, so let’s take a closer look. So according to the ‘About Us’ page of the official website, The Diplomat was launched in 2002. It is said to be ‘dedicated to quality analysis and commentary on events occurring in Asia and around the world.’ The publisher’s name is James Pach, and they employ a number of editors. I decided to read through some of the content published by the site, in an attempt to figure out what kind of quality we were looking at. I was also interested in taking a closer look at the website’s design. So let’s talk about that next. They also publish quite a few different types of content, ranging from Blogs, to Interviews, to Photo Essays, to Videos, to Podcasts, to a Magazine. I decided to read one of their featured articles, which had been published the same-day that I was writing this review, just to see what kind of style and quality the site goes for. And I am not sure how else to say it… but it read exactly like a news article to me. I browsed a few other pieces, and found the same to be true for them as well. It seems like The Diplomat is a publication that likes to deal in hard facts and entertaining stories… and for good reason. That seems to be the style that is giving them the generous volume of traffic that they have thus-far enjoyed… and seems to be what they want from any potential freelancers as well. I came across several different banner ads while clicking through the site. This did not surprise me, though, and was likely one of the methods that the site utilizes to earn cash. So I didn’t have a problem with it. There were quite a few of them, but I didn’t really find them annoying. So after looking through all of this, I came to the place where it was time to start researching what it would take to try to write for The Diplomat. I started looking around on the website for links to this information, and found what I was looking for. To find the section of the site dealing with writing and submitting submissions, I visited the ‘Contact Us’ link, which is found in the footer. There were links to several different other pages on this page, including links for General Inquiries, Advertising, and Write For Us pages. So I clicked on the latter option, which brought me here. So, I learned here that The Diplomat absolutely accepts unsolicited articles and blog posts. I even learned a lot about what the process looked like. First of all, you can submit blog posts that range from 400 to 800 words in length, or feature articles that start at about 1200 words in length. But, they also recommend pitching your ideas to an editor before proceeding with the writing, especially if you have not had anything published by them before. If you are going to submit an entire article, they prefer that you attach it to the submission form (located on their website) as a Word document. They also ask you to indicate, in your submission, if you hope to get compensated for the piece monetarily. If so, you should also indicate if the piece has been published anywhere else. Unfortunately, they do not really give us any numbers for what people get paid… so I imagine that it probably varies from piece to piece, depending on what they are looking for and on how long the piece is. It may also depend on the subject matter and on which category you are submitting it for. If you ever plan to submit anything to this site, though, I would most certainly recommend that you read through some of their articles in the relevant categories, to help you figure out exactly what types of content they like to publish, and to get an idea of the style that they like. They also say that you may not hear back from them unless they plan to accept your post. So if you don’t hear back from them regarding your post in 3 business days, they say to feel free to submit it to a different site or to publish it elsewhere. So yeah. This site seems to mirror many other similar sites in the sense that they will pay freelancers to submit work… but like a lot of other sites out there, they also (obviously) cannot guarantee that you will get anything accepted just because you submit it. This obviously creates a choice for any freelancer who is thinking about submitting content. On one hand, you may be wasting your time. But on the other hand, if you don’t try, you will never succeed. So the big question, then becomes this. Personally, as a writer, the topics that they publish on thediplomat.com are not the types of topics that I would probably be that interested in writing about. Yes, I like to read these kinds of websites in order to educate myself… but to be super honest, I am not really a ‘news-writer’ kind of guy. But… if you have the knowledge, the know-how, and the drive, then you can definitely make some money writing for sites like this. As for how successful you will be… well, that is kind of up to you. Sites like this need new content, but they can really only afford to pay for things that absolutely fit their criteria. So it might take some practice and some elbow grease to write content that will really fit with their vision. That may also mean that you will have to face a few rejections before you end up submitting something that will actually pay off. The good thing about The Diplomat is that you will know pretty soon. They get back to you within 3 business days, which makes them a lot faster about these types of things than most other websites like this that I have looked at. A lot of websites take weeks or even months to get back to you about article submissions… so at least with The Diplomat, you will know if you have been accepted or not within a fast time-frame. If I were a writer looking for a news site to write for, then I would absolutely give this one a shot. You may decide that it’s not worth the money after the first go-around, but there is really no way to know if this sort of opportunity would be right for you unless you actually gave it a try first. So yeah. You will not get rich quick with thediplomat.com, but this could most certainly be a website that could help you with your goals if you’re looking to make some extra money writing for news websites. Should you submit an article and see if you can make some extra money?